There are 80 comfortable rooms, restaurant (300 seats), Bistro, SPA center, Conference hall, Kid's play-room, Billiard hall, GYM, Weekend — house there. 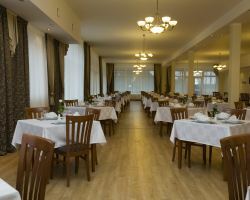 The hotel is located at a distance of 60 km from Riga! Amenities include: 80 rooms, restourant (up to 300 persons), wellness centre for the whole family, Spa procedures, billiard, kids play rooms, gym, conference room, Wi-Fi internet, bistro, kids playground, free parking. Spa Center: TRIO skin tightener, Spa SlimLine, relaxing massages, classical massage, Spa procedure pricelist, body fitness, oxygen cocktail, eliere cosmetology. Price includes: car parking, Wi-Fi internet, gym, kid's play room, morning swim, 21% VAT.